Place the cut up cauliflower in a microwave safe bowl, cover loosely, and microwave on high for 4 minutes. Drain cauliflower of all the water and place it and the cooked beef into an ungreased 9X13-inch pan. In a large bowl, combine the sour cream, mayonnaise, onion powder, bacon, butter and dressing. Gently toss sour cream mixture with beef and cauliflower. Bake for 40-45 minutes or until hot and bubbly. Sprinkle with cheese the last 10 minutes of baking. Approx. nutrition info per serving: 574 calories, 46g fat, 4g net carbs, 35g protein. 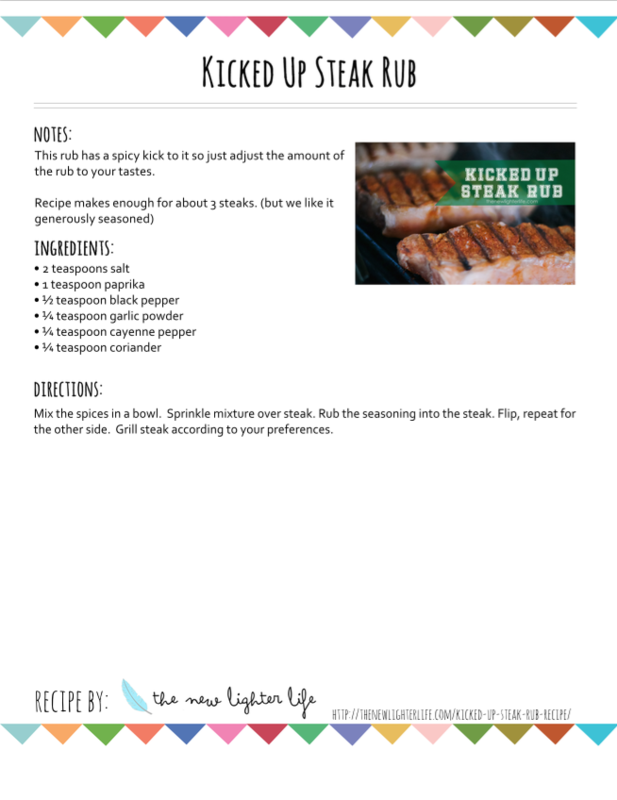 Click the image below to print this recipe. Nothing finishes a room or adds charm like custom window treatments. So today I’m sharing 8 of my favorite unique window treatment ideas gathered from around the web. Back to what seems like ages ago, I posted about our custom made RV curtains for our Class A. Okay, y’all…there are some limitations with an RV. But we stopped RVing almost 2 years ago and I’m oohing and aahing over the options out there! I may need to have an intervention done on me! You see for simplicity sake, I bought premade curtains from Target, but wow…the inspiration here is mighty tempting. Help!?! I’m so so tempted to make some changes. Please check out the linked websites to see how these beauties were made. I can’t find the source for this as a DIY project but Hobby Lobby has metal corner brackets that would be gorgeous for a unique window treatment similar to this look. This one isn’t so much a window treatment as it is a gorgeous way to add elegance to a room through your curtain hardware. Use a curved shower curtain rod to hang floor-length curtains. Stunning!! Anybody else get lost in window treatment ideas?? Please tell me I’m not alone! How many of you have a morning routine system for your family? Maybe mornings at your home look similar to how mine did 6 months ago. You know, the little creatures wake up and hang around in the pajamas until you lose your cool and start yelling. Don’t you dare tell me that my kids are the only ones that have the propensity to go into super-slow mo while whining and complaining about getting ready?! Ha! I was so sick of nagging the kids to get ready. I needed a solution. Look, if you have little people running around, (or laying around) not doing anything to get going, it gets frustrating fast. Personally, I’d tell them multiple times to do something as simple as get dressed or put dirty laundry in the hamper. For real, these are such simple tasks but my kiddos outnumber me. And let’s face it, I’m busy trying to get my day underway too. So I had to figure out a way to get them on board with a routine. Scratch that, I needed to find a way to get them excited about getting everything done. AND I had to remove the nag-factor. On a piece of paper, list their names, routines, and any special jobs for each child. 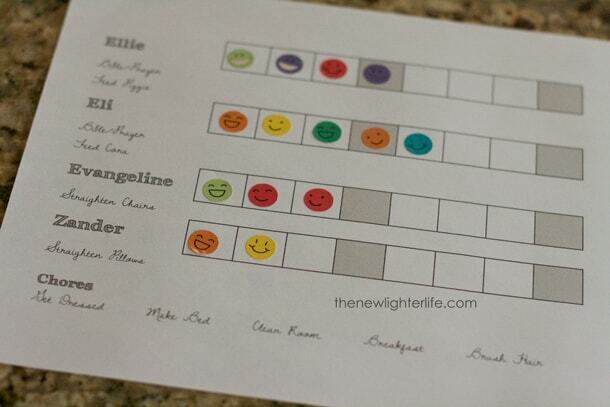 Place the routine paper on fridge or somewhere in a central location. Gather reward stickers and prize bucket. Explain to your children how it all works, what’s expected, and the reward. Remind them for a day or two, (especially for littles who can’t read) and watch them gain ownership of their morning. At the designated time, check to see where your children are with their morning routine. If they’ve accomplished everything, they get a sticker. 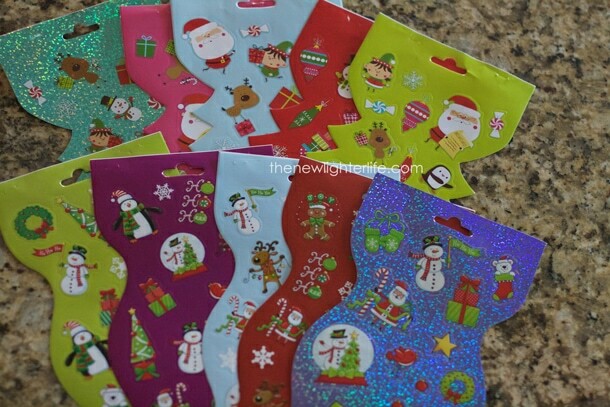 On the 4th day, they get a sticker and a prize from the prize bucket. So what’s in this prize bucket?? 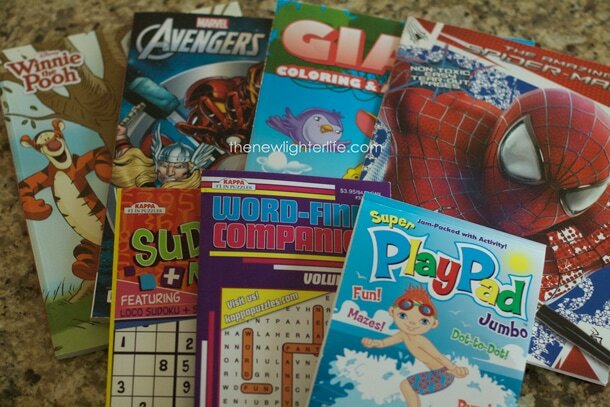 Coloring books and activity pads ($1/each). Gum, quarters, a media pass (10 min. or more), sticker sheet, etc. 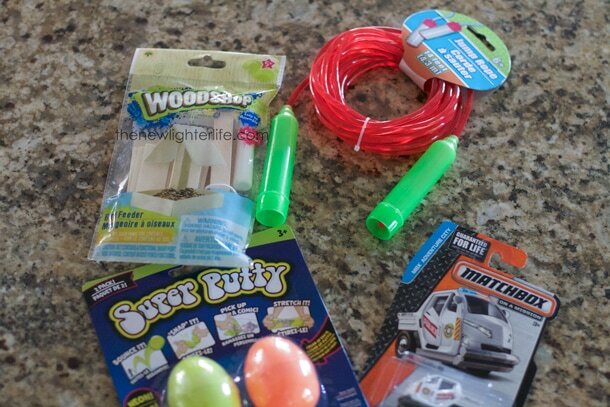 Make it inexpensive but something your kids will look forward to earning. The first couple of days, my kids, (especially my 2 littlest) had a hard time getting the concept. I gave them quite a few reminders but they still didn’t do their tasks. They figured out pretty quickly when they didn’t get a sticker and that means no prize. HALLELUJAH!! *disclaimer* This ONLY works if you enforce the routine and sticker chart. You have to take 3 minutes to check what they did and assign the stickers. Just to save you a couple of minutes, I’ve uploaded a customizable routine chart, (made in excel) for you to tweak till your heart’s content. All the boxes are there and the shading for the reward day, you just need fill in the information to suit your needs. (If you are curious about my font, I used Archistico Bold for the bold font and Dawning of a New Day). You can seriously take a blank piece of paper and draw out your routine if you don’t want to type anything (so don’t let that get in the way). I’d love to hear if this is working for you, so please share if you implement this! So I realize I’m late to the party…but I must admit, I stuck my nose up at the idea of adults coloring. If you are over the age of 14 and not coloring, today I’m going to make a case for why you should be coloring. ASAP. I’ve seen these coloring books around for months and I chalked it up as silliness. Like really…who has time to color?! You see in these highly responsible life of schedules, goals, work, and projects there is absolutely no time for such a frivolous activity. Or so I thought. About a month ago, I was on my way to D.C. with my dear friend, Nicole. She had all sorts of activity books for the flight. I thumbed my nose at the idea. Until we got up in the air. I’m furiously working on some Photoshop edits and I look over to see her just enjoying her flight. Whaaaa? By the end of our 1st flight, I was doing one of her dot-to-dots, (which is a whole other blog post). Ha! I eventually moved over to her coloring book and heavens to Betsy!! Every flight after, the flight attendants stopped to talk to us about adult coloring. It was like the Sisterhood of the Traveling Coloring Books. Okay…not really but I’m telling you, there is some major bonding over coloring. 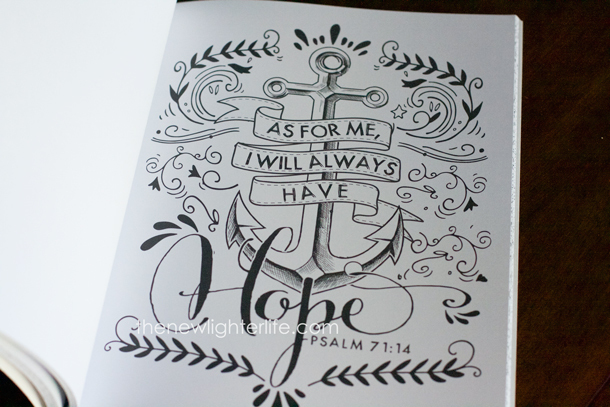 I picked up this gorgeous little coloring book in the airport and I adore it! You can buy it here, from Amazon. 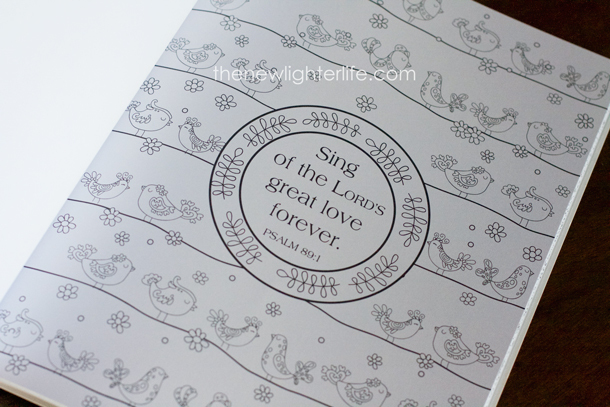 There are loads and loads of neat coloring books but what I like about this one in particular is that it has inspirational quotes and scriptures throughout, perforated sheets, and one-sided designs, (perfect for coloring with markers). Diminishes Stress. Let’s face it, as a whole, we are stressed out! And you know how I’m in time management mode? Well more than anything, I notice that my friends are also running around ragged. We will never have enough time to do everything. Coloring is so very relaxing and is super for getting rid of stress. Bonding Opportunity. My kids love to color but I rarely feel satisfaction or desire to color Elsa or Strawberry Shortcake. 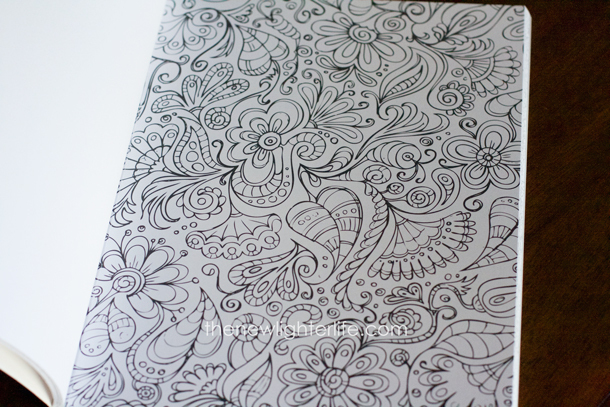 With my adult coloring book, I look for excuses to get to color with them. We talk, laugh, and just plain enjoy our time together where I’m fully engaged with them. Decorations. With the right coloring book, you can really create some beautiful pictures with basically no skill whatsoever. I have a few I’m planning to frame. Vision & Fine Motor Skills. How many of us sit at a computer, (or in front of our smartphones) for much of the day? I know I do and that doesn’t help my vision. Coloring not only helps vision but also fine motor skills. Yay!! Low Cost. You can buy fancy books, pencils, & markers for coloring but it can also be very minimal cost to get all those amazing benefits if you’re on a budget. And on that last point, I have amassed a few *ahem* (okay a ridiculous amount) of adult coloring resources on my pinterest board if you’d like to see some of the jewels I’ve found. Somehow almost a whole year has passed since I posted to this blog! That was one serious hiatus! Good news is…it’s over!! And I’m back to regular posting. 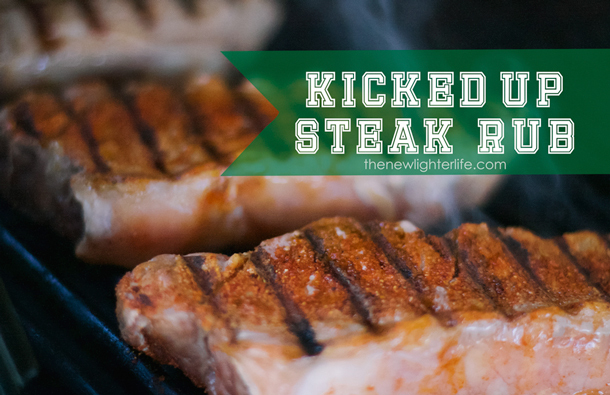 For my celebratory post back, I’m sharing with you our very favorite steak rub. 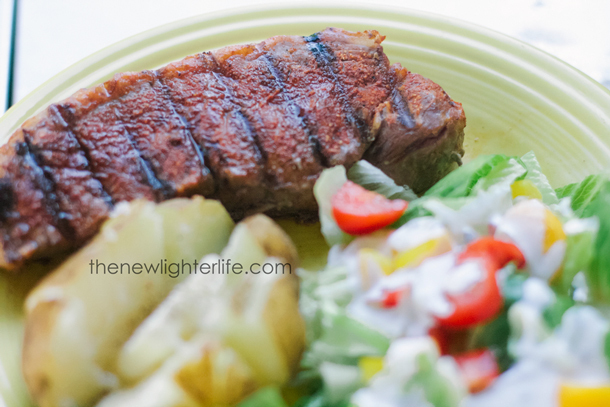 We used to eat steaks out at restaurants, but this rub is so good, I rarely even want a restaurant steak anymore. This is far better than some of the upscale steaks we’ve had out. It’s our absolute favorite! I got this from a friend years ago, and we’ve made it ever since! It will kick you in the hiney! 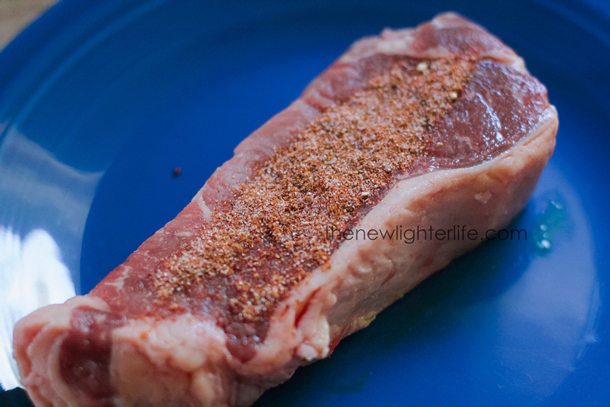 My kids, who do not like spicy foods, even like this rub but I use less rub for their steak. Adjust the amount of the rub to you preference. Mix the spices in a bowl. Sprinkle mixture over steak. Rub the seasoning into the steak. Flip, repeat for the other side. 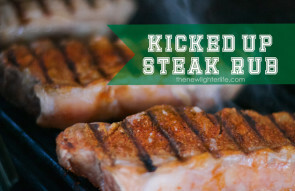 Grill steaks according to your preferences. Mmmm. 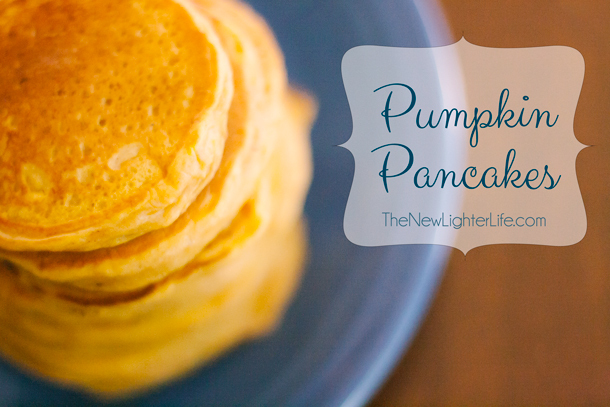 I love pumpkin as much as the next gal but until recently I hadn’t ever made or eaten Pumpkin Pancakes. Eli found a recipe for pumpkin pancakes in an old Highlights magazine the recipe called for pancake mix, which we never buy. We experimented with a couple recipes and this one from AllRecipes is utterly delicious, (shockingly better than Pioneer Woman’s)!! If you want ideas of how to make this with a pancake mix, head on over to AllRecipes, there seems to be a good substitute in the comments to that highly-rated recipe (linked above). We added freshly ground nutmeg to ours. All sweet pumpkin recipes should contain nutmeg. The recipe calls for 1 cup of pumpkin puree. We’re using canned pumpkin and that comes in a 15 oz can, leaving 7 oz of pumpkin left over and not enough for my pumpkin bread if I was being a stickler about amounts. So I just adjusted it to be half a can of pumpkin. I don’t think you have to get crazy about measuring is my point really. Waste not…want not. In a bowl, mix together the milk, pumpkin, egg, butter, and vinegar. 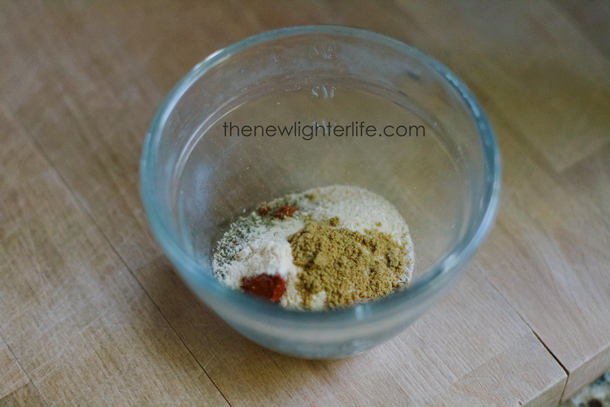 Add the flour, brown sugar, baking powder, baking soda, allspice, cinnamon, ginger, nutmeg, and salt in a separate bowl. Stir all the ingredients just enough to combine. Do not be tempted to add more milk to the batter, it will be thick. Heat a lightly oiled griddle over medium high heat. Scoop 1/4 a cup of batter onto the griddle and spread the batter out with the back of a spoon. Brown on both sides. Serve hot with maple syrup. 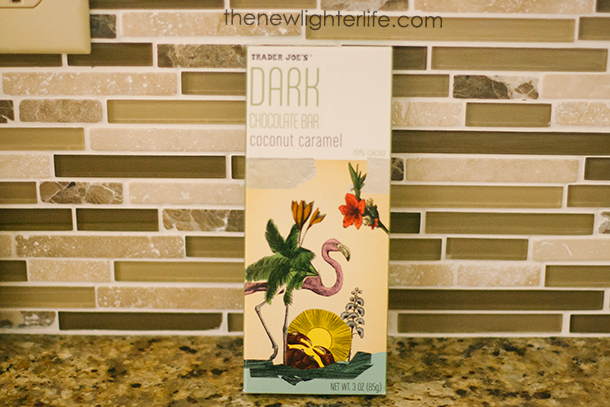 I might be obsessed but I’m estatic that a Trader Joe’s opened up closer to our home! 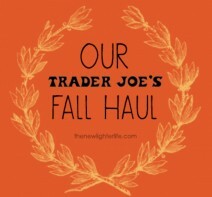 Today I’m sharing some of our Trader Joe’s Fall Haul. These babies are just fruit and NOTHING else! Love them! 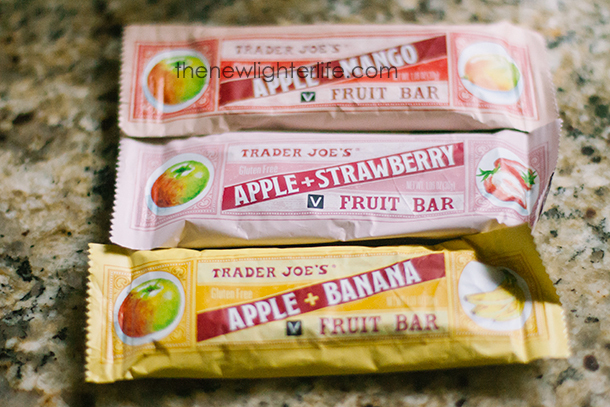 They also have an Apple Coconut bar…that one is NOT a favorite of our family. 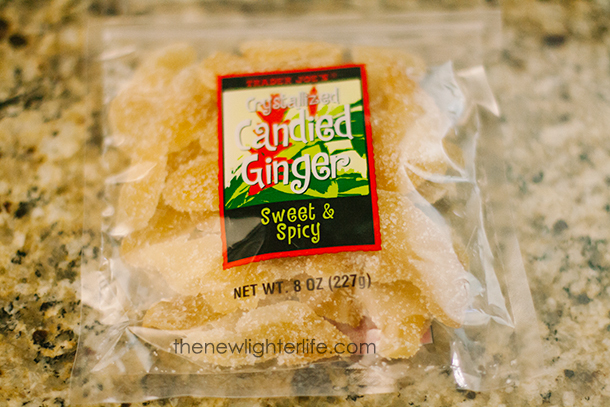 My kids LOVE the candied ginger! They are sweet and spicy! 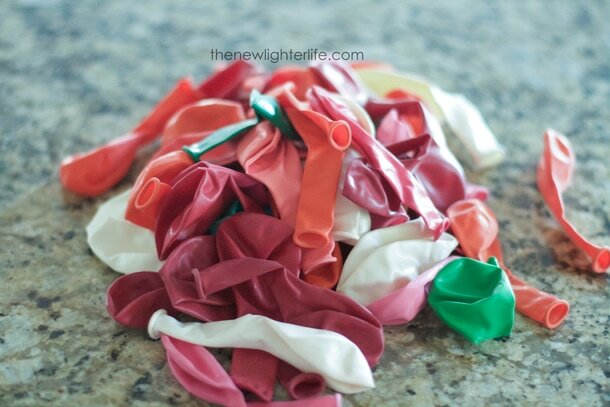 We use these for a candy treat, upset stomach, or for holiday baking. Oh and they are SUCH a great deal per oz compared to your regular supermarket! Mmmmm….pumpkin! 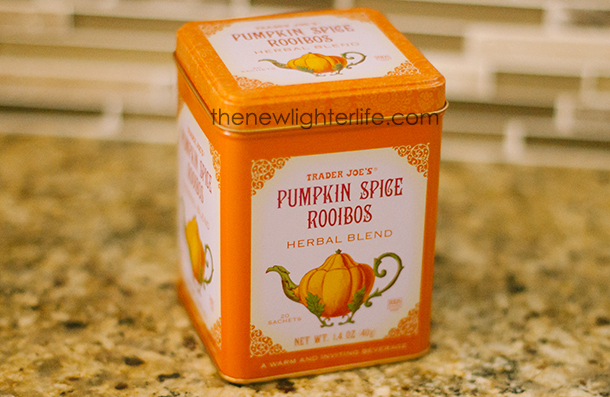 I’m not a huge tea drinker but I enjoy this seasonal tea (and I’m a sucker for a cute tin). I just discovered this little gem and I’m happy with how it flavors our food. I cook a lot with garlic and I have a nifty little Pampered Chef press for fresh garlic, but this makes cooking with garlic SO much more convenient. 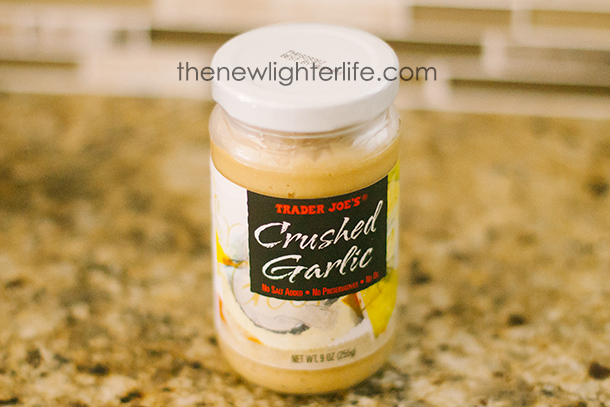 The 2 ingredients in the crushed garlic are Citric Acid and Crushed Garlic. I love simplicity of ingredients. We’ve been getting this little crackers for a while. They are totally old-fashioned and yummy!! 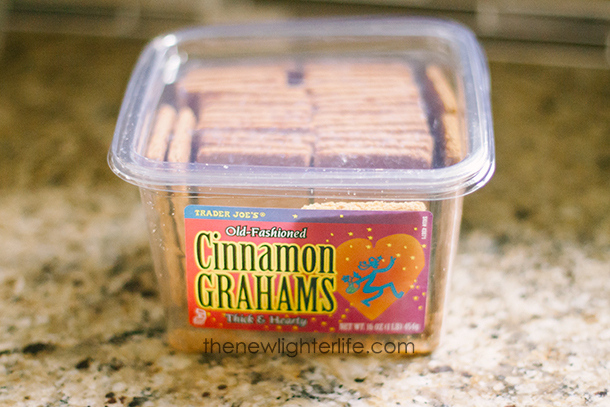 One day, I’ll be supermom and make homemade graham crackers. Until then, these will more than suffice. I’m not a connoisseur of wines but here is my take on these 4 wines all in the “cheap wine” price range. 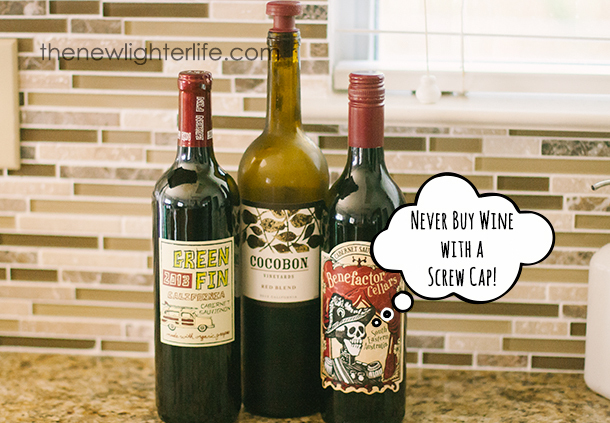 Green Fin – This Cabernet Sauvignon is an okay wine. Nothing to go crazy about but it is suitable in my opinion. I’d buy it again especially since it’s only $5! Cocobon – I bought their Red Blend and I LOVED it! Loved it! I HIGHLY recommend it and I’ll buy this one regularly, (it was only $7)! Benefactor Cellars – I’m not a wine expert but I know a terrible wine when I drink one. Benefactor Cellars ~ Cabernet Sauvingnon is a TERRIBLE wine! Terrible! I never throw wine away…but I don’t even think this one is suitable for cooking. I should have noticed there was a screw cap which is pretty much a sure sign that a wine is less than par. Listen to the skeleton pirate below! 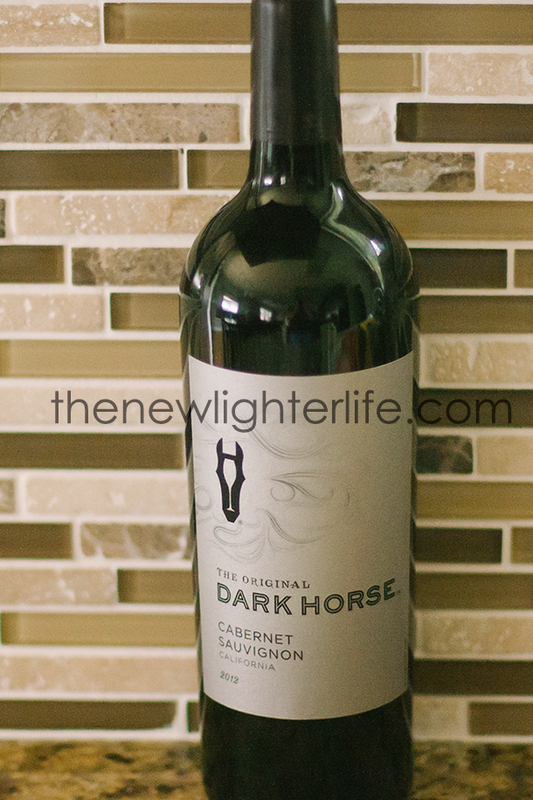 Dark Horse – Uh -yeah this was a big winner! $8 and relatively smooth! I’d still choose Cocobon over this one but this was a close 2nd place. Again…we got ginger thing going on here. 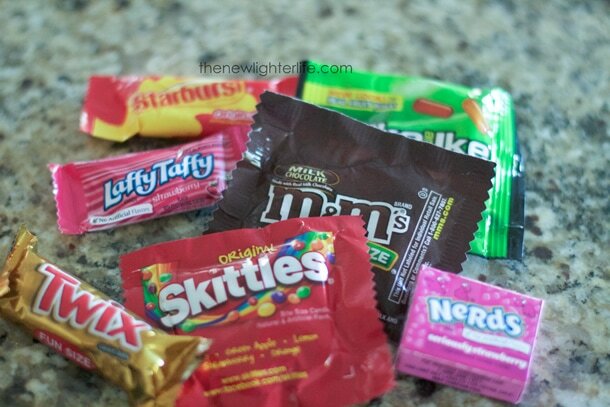 These are a nice treat for my little people. I debated about including this macaroni and cheese. Seriously. it’s mac n cheese and not a complicated food. To justify this inclusion, I must tell you that my kids eat mac & cheese about once a week. They don’t care for the Annie’s brand which has better ingredients (though more clumpy to make) than Kraft. 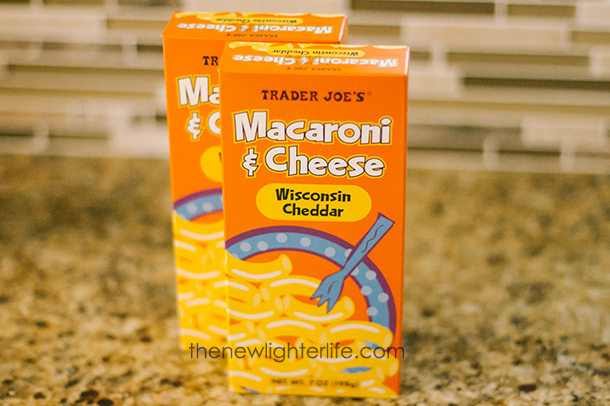 But they liked Trader Joe’s macaroni and cheese and it’s only $1. Win! This were just okay. A little too sweet for our tastes honestly but good flavor in-spite of that. Yum!!! Have gotten this for a while now. Very good chocolate with crunchy coconut in there! 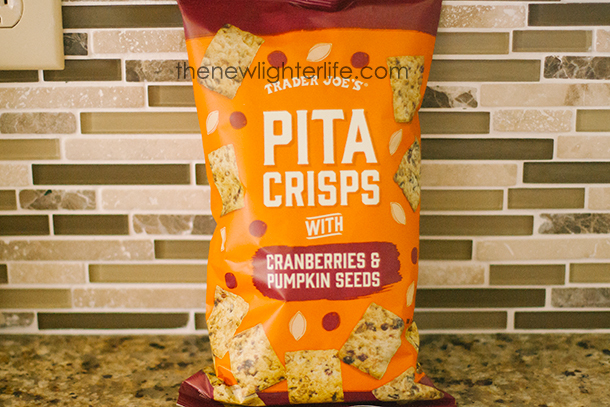 These are REALLY good but our dipping choices are pretty limited right now. 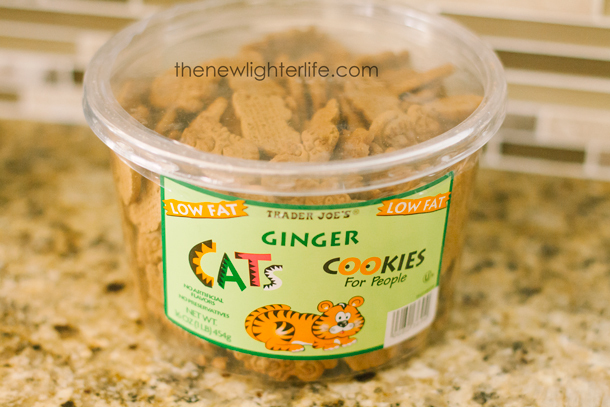 I think they’d be great with some sort of cheese ball…but my creativity is lacking to pair them with something deserving. Ever tried to find a salad dressing without sugar? 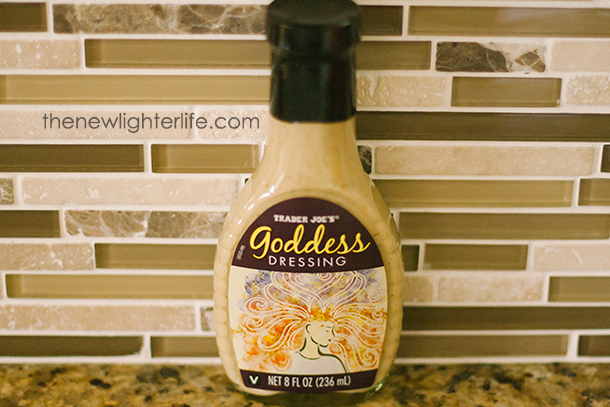 It’s tough but I’m happy to report the Goddess Sauce doesn’t have sugar. I’m not 100% sold on it yet, it’s pretty tart. We generally avoid fluoride. 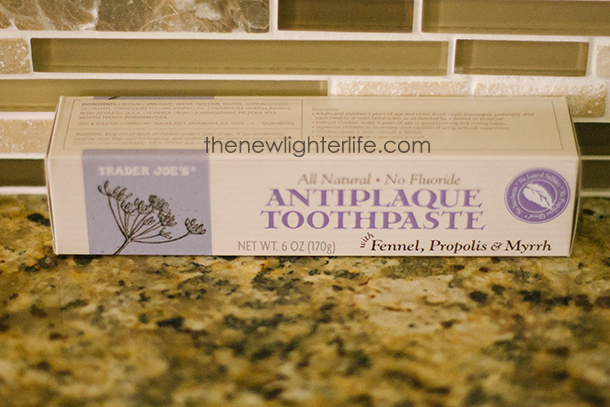 This toothpaste is less than $3! Yippee!! FYI – these are NOT Oreos. 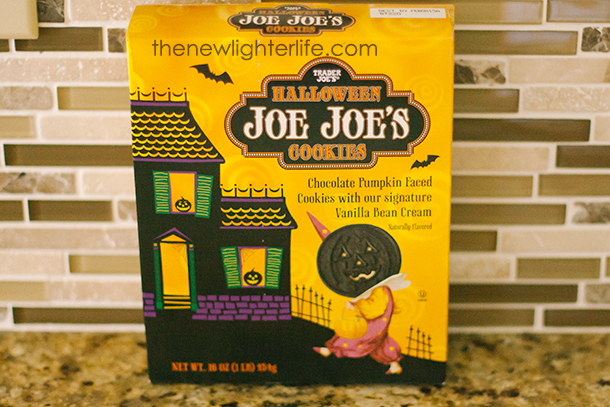 But for a store-bought Oreo substitute these fit the bill wonderfully! 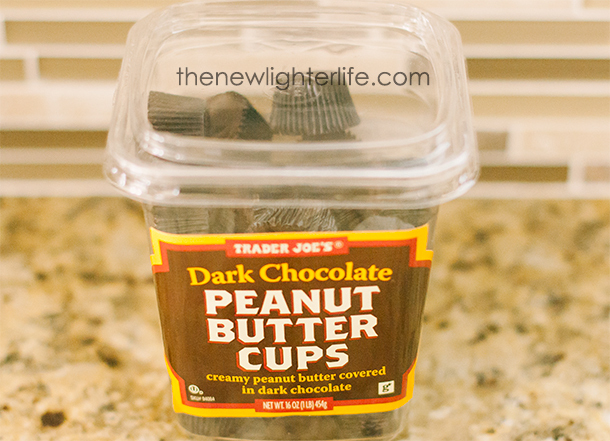 These have been a favorite of ours for a while, creamy peanut butter…mmmmm. Now if you compare these to fresh from the bakery bagels, you’ll be sorely disappointed. 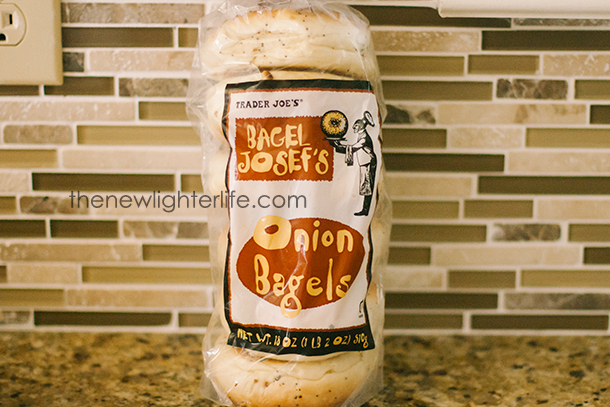 But compared to other shelf stable bagels, they’re pretty good. So these are just a few of the things we’ve been buying. 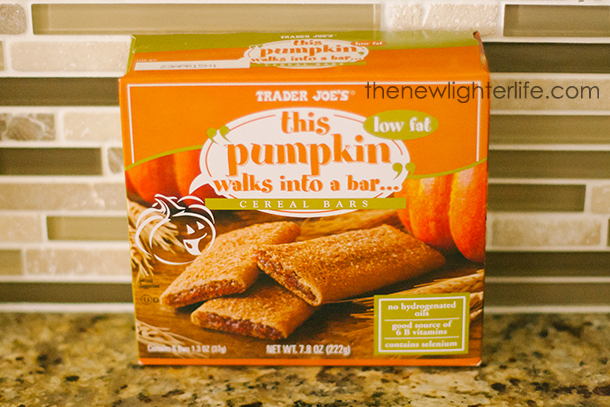 And of course, Trader Joe’s doesn’t know me nor have they ever heard of me. 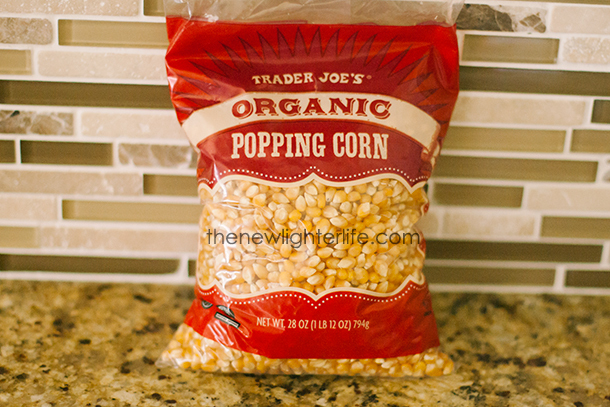 I’m just sharing what works and doesn’t work for us from Trader Joe’s. How about you all? 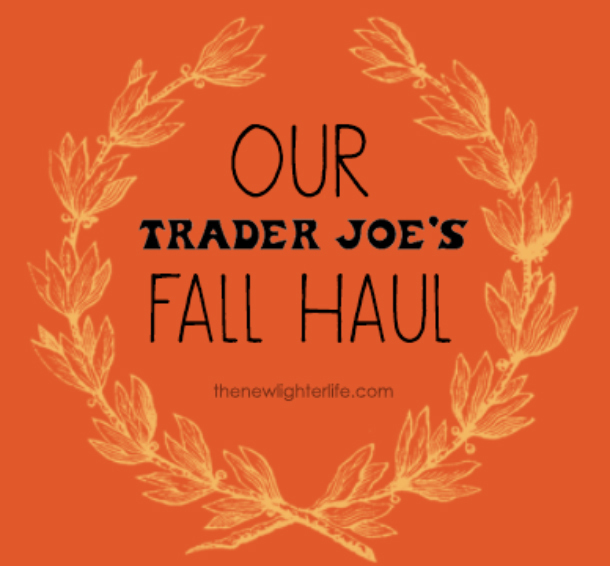 What are some of your favorites from Trader Joe’s that I missed out on?